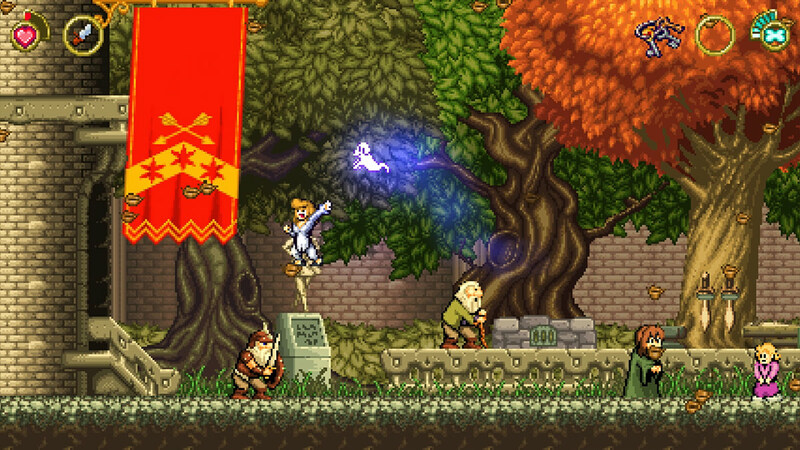 Aiming to be a retro platformer combining the feel of classics such as Ghouls ‘n Ghosts with the imagination of the lead developer’s seven year old daughter, Battle Princess Madelyn unfortunately ends up feeling more like a child was let loose on a level editor, to predictably disastrous effect. I wanted to like this game, I really did. The graphics are wonderful, the overall aesthetic of each area is interesting and the premise behind the game — that the lead developer’s young daughter inspired and helped design much, if not all of the experience — is both unusual and attention piquing. 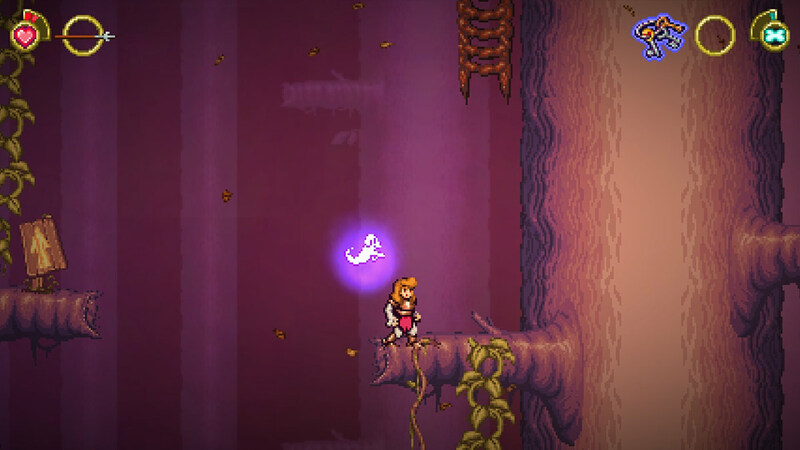 Battle Princess Madelyn‘s pixel art and tough, oldschool gameplay aim to hit nostalgic notes for those of us old enough to remember games on cassette tapes or pouring endless coins into arcade machines. Regrettably, the game itself plays out as a lackluster experience, neglecting the wealth of level design wisdom that has developed since those days of yore, resulting in a hugely frustrating cycle of repeatedly getting lost and dying, with no sense of progress. 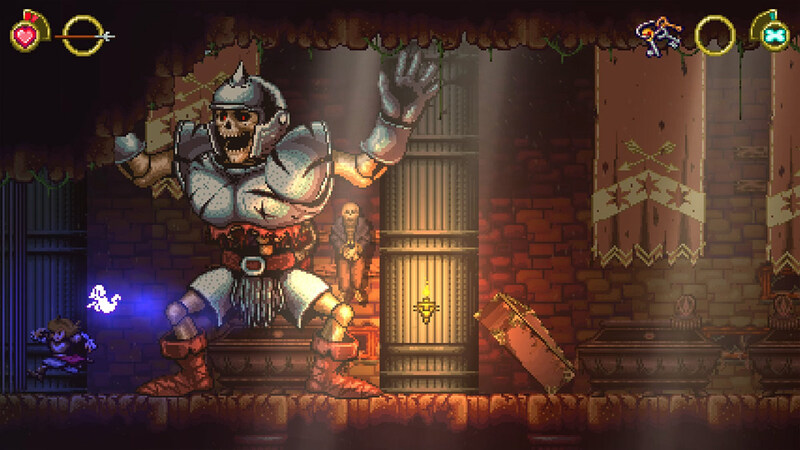 Madelyn boasts two modes — a story mode with a world to explore, NPCs to quest for and the usual adventuring, and a more straightforward arcade mode which plays more like the vintage classics that so readily inspire it, in particular the Ghosts ‘n Goblins/Ghouls ‘n Ghosts series. Story mode is the main adventure, offering a supposedly easier time, while the tougher arcade mode throws a lot more enemies at you, playing the oldschool “hold on to your pants” feel a lot closer to its chest. 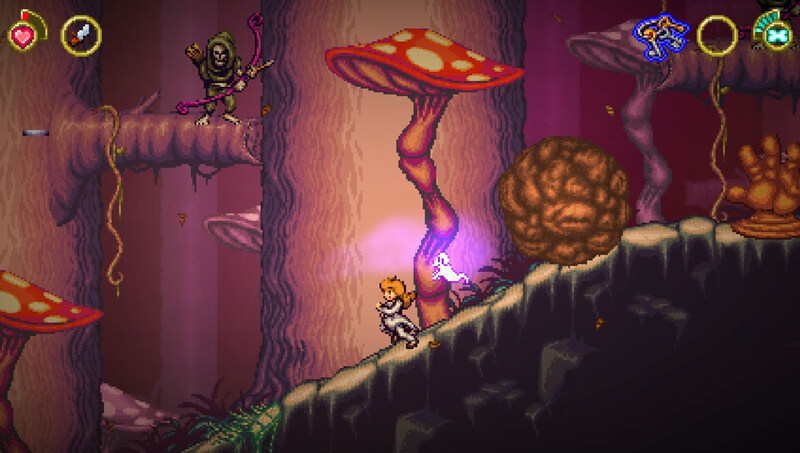 Firing up the game for the first time, I half-expected Battle Princess Madelyn to be very easy; after all, it’d make perfect sense that a game “co-developed” by a child would, in turn, be suitable for players of that age, who are typically bouncing around the fun, colorful environments of the likes of Mario and Shantae. However, whether by design or just developer inexperience, the game cannot remotely be accused of being easy. The first 30-40 minutes of the game eases you in nicely, and it’s clear that a lot of time went into polishing the initial experience. While elements like quest breadcrumbs and NPC dialogue are a little clunky, and the first section of the game is perhaps a tad too hand-holding, Madelyn quickly gets you up to speed with what to expect from your journey around the world. Mistakes lead to quick deaths, with Madelyn losing her armor when she’s down to a sliver of health (a nice nod to Ghouls‘ Sir Arthur), but the early game is reasonably forgiving. Unfortunately, once the first dungeon is cleared and the debut boss downed, things take a major turn for the worse. From the second area onwards exploring the maps becomes a tiresome chore, with little sense of direction and confusing layouts exacerbated by awful screen-by-screen level design. For instance, there are countless spots where as you progress you’ll end up on platform with no view of what’s below, and the leap of faith to whatever lays below often ends up a fifty-fifty chance of landing on an instakill obstacle. You’ll naturally end up on this platform as you try to figure out a way to continue through the second area, and whichever way you decide to jump, drop or fall off, you’ll end up dying in the water below. Oh, and you’ll respawn back on this platform. Excellent. The game is, unfortunately, chock full of inane level design decisions like this. Enemies spawn almost directly on your character at times, while others are placed in positions where it’s almost impossible to continue without taking damage — and in the early game when you can only take two hits before death, these feel more akin to stabbing your thumbs into a hedgehog rather than enjoying a tricky platformer. Add to this the regularity in which you’ll run out of magic, a resource partially spent to revive yourself whenever you die, and you’ll be sent back to the start of your current zone all the time. Other elements of gameplay also feel like they’ve missed the mark; simple things that modern gamers take for granted are missing from Madelyn, and the wound left behind aches constantly. Sometimes it’s little things, like being unable to throw weapons diagonally or, more frustratingly, upwards if you’re currently climbing something. Not a problem for most games, but Madelyn likes to add enemies right at the top of climbable things — not even slightly off to the side, just enough for you to quickly whisk yourself up onto the ledge and duck beneath any incoming projectiles, but right in the way to make sure you lose some of that sparse health you’re desperately clinging to. Just to be clear, my problem with Battle Princess Madelyn isn’t that “it’s too hard”, but that the core design of the game is extremely frustrating. I’ve been playing and completing punishing titles for decades — including the Ghosts games on the ZX Spectrum — so I have no problem with tricky games as long as they’re fun and designed well. Madelyn simply isn’t. Common staples of platformers have been ignored or forgotten, too. Being struck by (or landing on) an enemy results in a hefty knockback but the game doesn’t offer any true invincibility frames during the loss of control, so expect plenty of unavoidable deaths from knockback into spikes, water and other hazards. And while the game does offer a rudimentary fast travel mechanic, the stones that you can warp to and from are few and far between, sometimes with multiple areas spanning between them. I would’ve liked to have seen some form of item that could warp you back to the last fast travel stone you visited as traversing the maps to head back to a town is not only monotonous but, with the hefty amount of cheap deaths, frustrating to the point of simply preferring to quit the game instead. Simple additions would make the current nightmare of exploring the areas much easier; an example would be the countless arrow signs all over the place that tell you nothing except “something is this way… somewhere”; giving the player the ability to interact with the sign to see what the hell is actually in that direction would be a godsend. I spent far too long putting up with instant deaths, pixel perfect jumps and invulnerable monsters following these signs before reaching the fabled exits they pointed to… which whisked me back to the previous area. All in all, there’s a pervasive feeling that Madelyn simply wasn’t tested by regular players outside of perhaps friends and family. So many glaring issues — aimless level design, failure to explain mechanics and so forth — would easily be spotted by fresh eyes, and this feedback would’ve truly been invaluable, possibly turning a mediocre exercise in frustration into a fun, replayable experience. I do hope for a sequel, as I’d love to see this game done right, living up to its full potential.